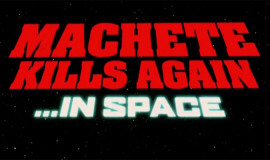 Robert Rodriguez comes through yet again with another straight-up badass movie, Machete Kills, the follow-up to the OG slasher/exploitation classic Machete. The cast in this movie is a laundry-list of big stars and major babes, the latter of which includes Amber Heard, Vanessa Hudgens, Jessica Alba, Sofia Vergara, Michelle Rodriguez, and even Lady Gaga. Mel Gibson, Dany Trejo, Charlie Sheen, Cuba Gooding Jr., and a bunch of other clutch dudes fulfill the testosterone quota. Check out the crazy Red Band trailer below (along with the trailer for the original Machete) that showcases some of the epic action in the movie that drops October 11th.